European Parliament election s are often criticised for lacking the required level of voter engagement to confer democratic legitimacy to the integration process. Jonathan Bright, Diego Garzia, Joseph Lacey and Alexander Trechsel assess whether ‘transnationalising’ European elections by allowing voters to back parties in other EU countries would help alleviate the problem. They argue that language barriers may represent a challenge, but suggest that internet-based ‘voting advice applications’ could help bridge this gap and offer a more representative range of choices to national electorates. The European Union is facing one of the most challenging moments in its recent history. While the struggle for a solution to the common challenge of migration and refugees continues, the spectre of debt, recession and high unemployment continues to haunt the countries of the southern Eurozone, with the likelihood high of another round of acrimonious negotiations between creditor and debtor countries in the near future. These crises have been toxic for public perception of the EU across the union, with trust in institutions such as the European Parliament declining to record lows in recent years (though they somewhat recovered in 2015). One common element among both of these crises is the question of whether the EU has any democratic legitimacy when making key decisions which appear to produce winners and losers among nation states. The EU’s (lack of) legitimacy as a democratic body is, of course, a classic problem in EU studies which has plagued the organisation since its inception. A recurring theme in this debate is the failure of the European Parliament, the EU’s only directly elected institution, to establish itself in the minds of the European public as a legitimate locus of power. One of the major reasons put forth for this lack of legitimacy is the status of European Parliament elections as “second order”, being treated as a minor engagement in ongoing national political battles, rather than a major event in its own right. The lack of interest in the event is reflected by the continuously declining turnout witnessed in these elections, which stood at just over 42 per cent in the most recent poll in 2014. In a recent study, we examine a proposal that may go some way toward addressing this problem: the ‘transnationalisation’ of European Parliament elections, which would involve allowing voters to vote for parties in any EU member state when they went to the polls (at least for a portion of seats in the parliament itself). Such a proposal could play a role in helping European elections to break free from the clutches of national politics: in particular, when campaigning, national parties would have to adjust their electoral offer to both take account of the increased competition for their ‘national’ vote and also to potentially address voters in other countries. Of course, such a move would face significant practical challenges. Voters would be faced with around 300 major parties, most of whom would be communicating in a foreign language. To address this problem, we suggest that the election would have to be at least partially supported by a number of ‘voting advice applications’, which would allow citizens to sort through the multitude of different parties on offer. These tools have become increasingly popular and are recognised in political systems around the world. 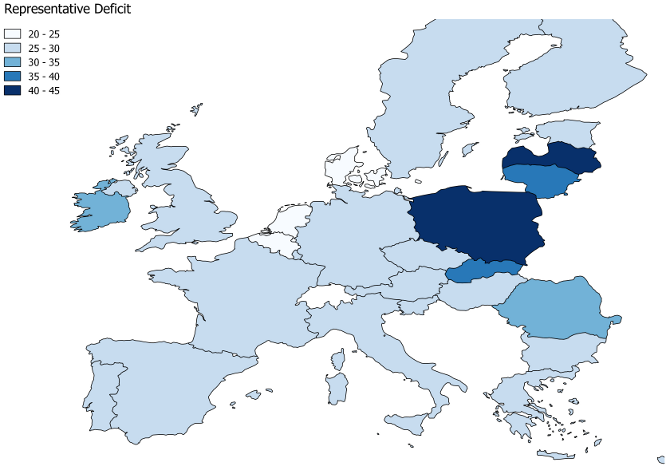 Note: Countries with a darker colour have a greater ‘representative deficit’ than those with a lighter colour. For more information see the author’s recent article in European Union Politics. Our article also seeks to collect evidence on the extent to which this change would be welcomed by European citizens. We do so using data gathered from the EU Profiler, a voting advice application which was created and run during the 2009 European Parliament election and which attracted hundreds of thousands of users. We would not expect everyone in Europe to want to vote for a party from another country, and our data show that these people are indeed in a minority: around 18 per cent of respondents indicated that they would be interested in doing this. We found these people were more likely to be those who were dissatisfied with the state of their current national democracy; we also found that they were more likely to be people who could improve their representative fit by finding a party that more closely overlapped with their interests. Our data furthermore enables us to estimate the level of representative ‘deficit’ which could be found in each country, as measured by the extent to which preferences of voters are unrepresented by parties, shown in the figure above. Hence transnationalising European politics in this way would also have the added benefit of allowing people unhappy with their national politics to find better representation elsewhere. For more information on the research, see the authors’ recent article in European Union Politics. Jonathan Bright is a Research Fellow at the Oxford Internet Institute in the University of Oxford. Diego Garzia is a Research Associate at the European Union Democracy Observatory (EUDO), European University Institute. Joseph Lacey is a Junior Research Fellow in Politics at University College, and is associated with the Department of Politics and International Relations, University of Oxford. He holds a PhD from the European University Institute and was a Fulbright Schumann awardee. Alex Trechsel is Professor of Political Science and Head of the Department of Political and Social Sciences of the European University Institute. On matters affecting the UK upon which its citizens vote, why should foreign nationals have any vote at all, even those who are resident there? The writers have put forward a constructive suggestion. @Joe Thorpe. All but the swivel-eyed would see some distance between having a democratic deficit, largely attributable to voters’ indifference, and a dictatorship. It is a constructive suggestion but the many difficulties with implementation, not least how elected representatives in some other country can interact with the voters who have chosen them, could bring about the opposite effect to that sought. Many of the voting public would, I think, be hard pressed to say what good purpose do MEPs serve at present. If they cannot answer that, pan-EU voting is not going to help. Even in national elections people vote within geographically narrow constituencies. They buy in to the higher ideal of a national body politic largely because there are national political parties. It’s not the only reason, but this is what is missing at the EU-level. Trans-European political parties exist, but they do not campaign as trans-European political parties. National parties have representatives as MEPs. If prospective MEPs were to campaign as memebers of the political parties they will join in the European Parliament, it would go some way to increasing buy-in to a European body politic amongst ordinary people. Pan-EU voting as described above would lead the electorate to feel that voters in neighbouring countries were drowning out their voice, leading to an increase in nationalistic sentiment as psuch-back and more frustration with EU ‘meddling’. You need an increase in local links to the European Parliament, not an increase in interstate obfuscation. There are more practical difficulties to this than at least this blog post suggests. For one, different member states have different constitutions putting different constraints on political action. The sort of explicitly fascist or quasi-fascists allowed to rise in many European countries are forbidden by law – or at least much of their expressive activity would be – in Germany, for example. From a political perspective, the potential for backlash seems very strong, as well. Minorities mobilizing against e.g. Brexit are already labeled fifth columnists in their countries; how much more resentment and nationalist sentiment would it kick up if they were actually importing foreign parties to represent their views in national parliaments?